Dengue and West Nile viruses are highly cross-reactive and have numerous parallels in geography, potential vector host (Aedes family of mosquitoes), and initial symptoms of infection. While the vast majority (> 80%) of both dengue and West Nile virus infections result in asymptomatic infections, a minority of individuals experience symptomatic infection and an even smaller proportion develop severe disease. The mechanisms by which these infections lead to severe disease in a subset of infected individuals is incompletely understood, but individual host differences including genetic factors and immune responses have been proposed. We sought to identify genetic risk factors that are associated with more severe disease outcomes for both viruses in order to shed light on possible shared mechanisms of resistance and potential therapeutic interventions. We applied a search strategy using four major databases (Medline, PubMed, Embase, and Global Health) to find all known genetic associations identified to date with dengue or West Nile virus disease. Here we present a review of our findings and a meta-analysis of genetic variants identified. We found genetic variations that are significantly associated with infections of these viruses. In particular we found variation within the OAS1 (meta-OR = 0.83, 95% CI: 0.69–1.00) and CCR5 (meta-OR = 1.29, 95% CI: 1.08–1.53) genes is significantly associated with West Nile virus disease, while variation within MICB (meta-OR = 2.35, 95% CI: 1.68–3.29), PLCE1 (meta-OR = 0.55, 95% CI: 0.42–0.71), MBL2 (meta-OR = 1.54, 95% CI: 1.02–2.31), and IFN-γ (meta-OR = 2.48, 95% CI: 1.30–4.71), is associated with dengue disease. Despite substantial heterogeneity in populations studied, genes examined, and methodology, significant associations with genetic variants were found across studies within both diseases. These gene associations suggest a key role for immune mechanisms in susceptibility to severe disease. Further research is needed to elucidate the role of these genes in disease pathogenesis and may reveal additional genetic factors associated with disease severity. Dengue (DENV) and West Nile (WNV) viruses are mosquito-borne viruses in the Flaviviridae family, which also includes other viruses such as Zika and yellow fever. These viruses can cause disease with substantial public health impact. DENV and WNV are found in similar areas of the world, can be carried by the Aedes family of mosquitoes, have similar initial stages of infections and similar symptoms of mild febrile illness, and are highly cross-reactive; however, severe disease manifests differently for these two viruses [1–3]. West Nile Virus was first identified in Uganda in 1937, has been endemic in the United States since 1999 , and is estimated to have infected 3 million people . While the majority of infections are asymptomatic, ~ 20% of infections lead to mild febrile disease in infected individuals and 1% of infected individual experience severe, neurological disease such as meningitis and encephalitis . DENV has a vastly higher disease burden, with an estimated 50 million cases and 25,000 fatalities worldwide annually [7, 8]. The majority of DENV infections can be classified as asymptomatic or mild febrile illness, with approximately < 1% progressing to Dengue Hemorrhagic Fever (DHF) or Dengue Shock Syndrome (DSS). DHF is delineated from mild DENV febrile illness by the increase in vascular permeability, while DSS has the additional development of circulatory shock [7, 8]. For both WNV and DENV, known risk factors such as immune-compromised states or advanced age are associated with susceptibility to mild and severe disease [9, 10]. The mechanisms by which an infection leads to severe disease in a subset of all infected individuals is incompletely explained. Differing immune responses to infections, including elevated cytokine responses, have been proposed [11–13] and we have recently shown that geographic location is not a driver of severity of WNV infection in a localized region . In addition to similarities in the early stages of infection [15–17], both viruses induce strong immune responses including chemokines (such as IL-8) and cytokines which up-regulate inflammatory reaction (such as TNF-α, IL-1, Il-6, and IFN-β) [18–21]. Renewed interest in understanding flaviviral infection and disease susceptibility comes as climate change expands the number of individuals at risk of exposure to WNV and DENV [3, 22], and with outbreaks of related flaviviruses, most notably Zika [23, 24]. Genetic differences are additional explanations of individual susceptibility to symptomatic disease, and previous genome-wide association studies (GWAS) and candidate-gene studies have identified genetic factors associated with DENV or WNV disease pathogenesis. To assess the current state of knowledge on genetic variation associated with these flaviviral diseases, and to identify any shared features of anti-viral responses, we conducted a systematic review and meta-analysis of the published associations to date between genetic variants and development of DENV or WNV disease. 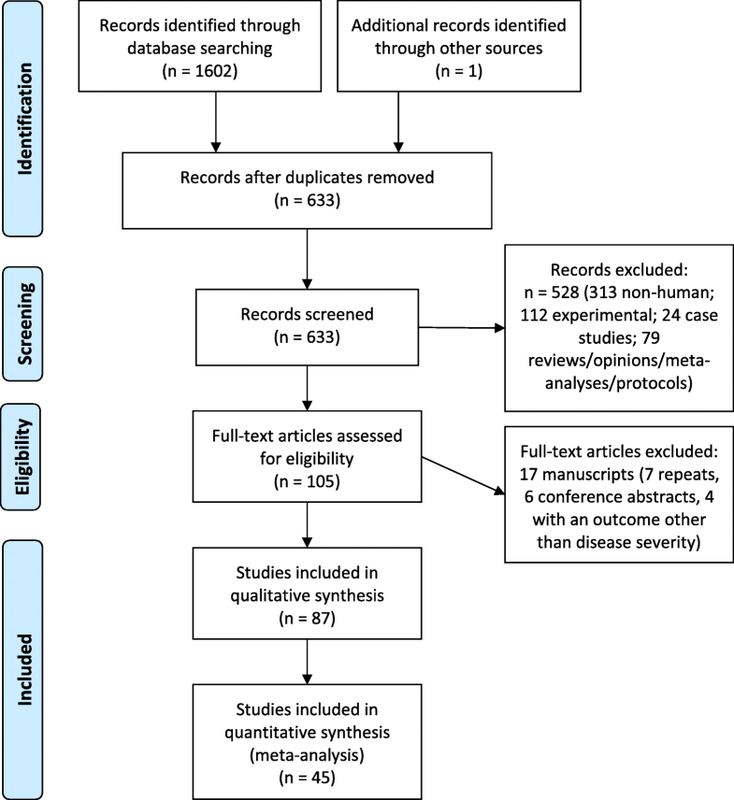 A systematic review of genetic factors and WNV or DENV disease was conducted using the Preferred Reporting Items for Systematic Reviews and Meta-Analyses (PRISMA) (Additional file 1) . Medline, PubMed, Embase, and Global Health databases were used to search the literature. Search terms included West Nile or DENV and genetic factors; the same set of text words was used for all databases in conjunction with subject headings that were tailored for each database. The text word search specified West Nile or Dengue in the title, a genetic term in the title or abstract, and a human-related term in the title or abstract (Table 1). A sample search strategy is included in the appendix (Additional file 2). Case-control studies which examined at least one genetic factor associated with either viral disease were included. Studies on non-human (e.g., viral, mosquito) genetics and case reports on single patients were excluded. Reports published prior to May 2017 were included in the review. An ancestry search was done of references of selected studies to collect additional potentially relevant references. Two researchers reviewed the titles and abstracts of all studies and identified potentially relevant articles within Covidence with 98.6% consistency . Discrepancies were resolved through re-review and mutual consensus. Both researchers read the full text of all of the selected potentially relevant articles and identified the final reports to be included in this review. Data sets were extracted without personal identifiers and organized into literature tables. The main fields included authors, year of publication, country, sample size, case and control group definitions, genotyping method, genes and genetic variants analyzed, genotype count data when available, odds ratios (OR), and statistical analysis method. When two or more studies examined the same variants, we used the raw genotype data to calculate ORs with 95% confidence intervals using the R package Epitools . When the raw genotype data were not available within the published papers, we requested the data sets from corresponding authors of the studies. Of the six authors contacted, three shared data, two indicated they no longer had access to the data, and one did not respond by date of submission. In order to make comparisons across the different DENV phenotypes used in the studies, we compared asymptomatic DENV infections and controls with all symptomatic infections (DENV fever, DENV hemorrhagic fever, and DENV shock syndrome). Using the genotype data, we calculated ORs for each study under a dominant model, recessive model, homozygote mutant versus homozygote wild-type, and heterozygote versus homozygote wild-type. We meta-analyzed the ORs using RevMan . The genetic model with the most significant meta-OR is presented here. When this model was the homozygote mutant versus homozygote wild or the heterozygote versus homozygote wild, we included both of these models for that particular single nucleotide polymorphism (SNP). We assessed the quality of each study with the Newcastle-Ottawa Quality Assessment Scale for Case-Control Studies , which assesses each study’s selection, comparability, and exposure ascertainment approach. To identify all published research assessing the role of genetic variation with DENV or WNV disease, we executed the above search strategy and identified 633 published reports (Table 1, Fig. 1). Two researchers independently reviewed the titles and abstracts of these 633 papers and identified 104 papers for further full-text review in this meta-analysis (Additional file 3). One additional paper from 1987 was identified as pertinent during the ancestry search and was added to the review. The final analysis includes data from 87 of the 105 publications, following exclusion of 18 papers for cause (seven repeats, six conference abstracts, and five with an outcome other than disease severity). Reflecting the higher disease burden and longer research history of DENV virus, of these 87 papers selected, 74 studied DENV-infected populations and 13 focused on WNV. Notably, 27 separate HLA alleles were examined by two or more research groups for an association with severe DENV disease (Additional file 4). Four research groups analyzed HLA alleles for an association with WNV disease (Additional file 5), however there was no overlap in the alleles studied. Although HLA variants show substantial contribution to disease outcome, significant variations in study design, data analysis platforms, data availability and presentation precluded our in-depth meta-analysis of these data. Previous reports of genetic associations with WNV disease severity focused on U.S. or Canadian populations and compared severe and non-severe infections. Overall, these studies identified 12 gene variants and significant findings include SNPs of multiple immune-related genes such as RFC1, SCN1A, and IRF3 (Table 2). For genes with genotype count data available for ≥2 studies, we conducted a meta-analysis of genetic association to disease severity. Meta-analysis allows recognition of well-established genetic associations and identification of redundant studies for genes with null associations. We found that SNPs in MX1, OASL, OAS1, RFC1, and CCR5 were studied by multiple research groups for an association with WNV disease (Table 2). To assess the overall association of these SNPs with WNV disease, we calculated a combined OR for each gene based on the genotype counts under four different genetic models. Of these, CCR5 and OAS1 meta-ORs were significant under a dominant model, with meta-OR of 0.83 [95% CI: 0.69–1.00] and 1.29 [1.08–1.53], respectively (Fig. 2). The CCR5 meta-OR was also significant under an allelic model with a meta-OR of 1.22 [95% CI: 1.03–1.44]. The CCR5 delta 32 deletion is associated with more severe disease while the OAS1 allele G was associated with less severe disease. Seventy-four studies have examined genetic associations with DENV disease severity and more than 30 genes have been implicated in DENV disease (Additional file 3). SNPs that were studied by only a single research group are presented in Table 3. We also include SNPs studied by multiple research groups, but for which genotype data was unavailable or the comparison groups of multiple studies could not be analyzed together. Among the DENV studies, the same variant within 17 genes was studied by two or more research groups (Table 3). 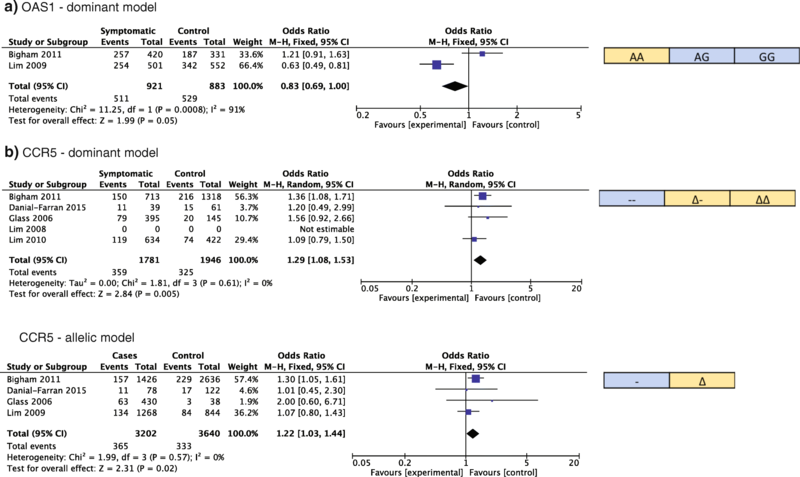 Four genes had significant meta-ORs (Fig. 3). 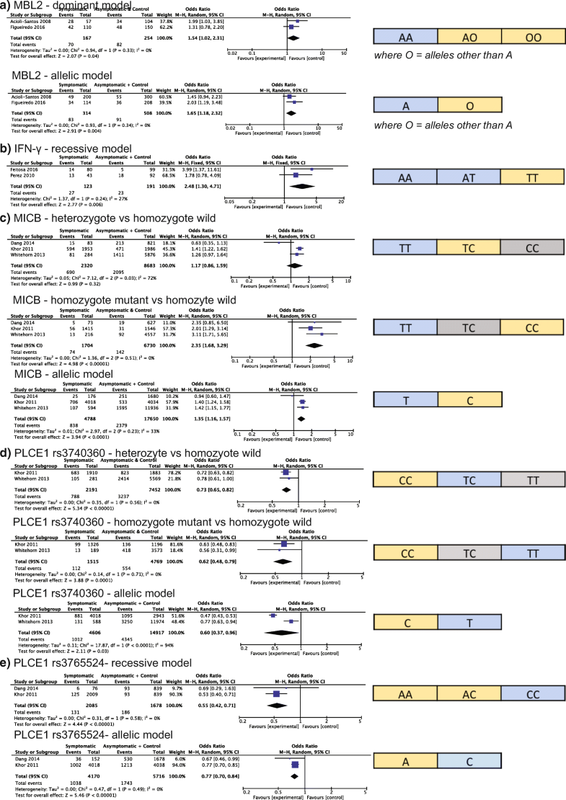 For a SNP in MBL2 (exon 1), we calculated a meta-OR of 1.54 [1.02–2.31] under a dominant model and 1.65 [1.18–2.32] under an allelic model, with alleles other than the A allele being associated with more severe disease. The T allele for SNP rs2430561 in the IFN-γ gene was associated with severe disease under a recessive model with a meta-OR of 2.48 [0.30–4.71]. For a SNP located within MICB (rs3132468), we found the CC genotype had a significantly greater association with severe disease (meta-OR 2.35 [1.68–3.29]), but the heterozygote genotype showed no significant association with disease severity as compared to the TT genotype (meta-OR = 1.17 [0.86–1.59]). For this SNP, the C allele was also found to be significantly associated with disease as compared to the T allele (meta-OR = 1.35 [1.16–1.57]). For two SNPs located within the PLCE1 gene, every model tested was significant, with the most significant meta-ORs being 0.62 [0.48–0.79] for TT genotype as compared to CC genotype for rs3740360 and 0.55 [0.42–0.71] under a recessive model for rs3765524. TNF-α (rs1800629 and rs361525) was the most studied gene, but none of the models tested provided a significant meta-OR. Based on the Newcastle Ottawa Scoring System, the average quality score was 5.76 (range: 3–7) for the WNV publications and 5.10 (range: 2–7) for the DENV publications (Additional file 6). We also assessed whether the study authors corrected for multiple testing, and found less than half of both WNV and DENV studies provided corrected p-values when appropriate, indicating an inflated type I error rate. We have examined genetic variants that show association with DENV or WNV disease severity. This analysis was undertaken to identify genetic differences that are significant drivers of susceptibility to symptomatic disease that may shed light on mechanisms of immune resistance to these viruses. Among the 87 studies examined, a wide range of genetic targets was found to be significant, with many of the genes unsurprisingly playing a key role in the immune system defense against viral infections (Additional file 7). Despite the large number of studies, only 27 genes were studied by more than one research group for an association with either disease. Throughout these studies, several key genes rose to the forefront as the most studied and the most significant associations. Many studies focused on the HLA region of the genome, and, although inconsistencies in data presentation preclude a meta-analyze of these results, there were clear signs of the importance of this area for both diseases. With the central role of HLA for the immune system, polymorphisms in this region have been well studied for associations with disease. The area is highly polymorphic, however, leading to difficulties for comparing the diverse range of alleles. Adding to this complexity, DENV serotypes interact differently with HLA . The regions identified in this systematic review, including DRB1, DQA1, DQB1, A, B, and C, are among the most diverse regions of the HLA region . A recent study examined some of these regions by supertype, and found the B44 supertype could be protective against DHF during secondary infections and that the A02 and A01/03 supertypes could be associated with more severe disease . KIR genes, which are expressed on the surface of natural killer cells, also have wide genetic variability as noted with HLA genes . While several KIR alleles were studied in DENV-infected populations, only one publication to date has examined KIR genotypes in West Nile virus-infected individuals, and this study had a sample size of four . The results suggested a possible association; this, in conjunction with the results of the DENV research in this area and the genes’ highly polymorphic nature, could be an area that should be explored further. Infection with WNV has been shown to lead to diversification of KIR receptor expression . In addition to the research outlined above, researchers have examined the association of KIR genotypes with DENV infection in vitro. Within the in vitro research, the timing of natural killer cell activation has been linked to disease severity and interactions between KIR and HLA have been suggested [36–38]. Another key non-HLA gene identified to be associated with WNV disease was OASL, which codes for an enzyme that is induced by type 1 interferon and viruses . OASL was first identified to have a potentially critical role in WNV disease pathogenesis in 2002, when researchers found that mice with a truncated form of the gene were more susceptible to disease . Elevated activity of the OAS genes has also been associated with more severe DENV infection in vitro . This data and the significance of variation within the OAS genes for WNV outcomes highlight the importance of the interferon pathways in response to flavivirus infections and suggest a need for further in depth examination the association of genetic variability within OAS and DENV severity. CCR5Δ32 was the only gene studied by two or more research groups for each disease. CCR5 was first identified as a co-receptor for HIV in 1996, and CCR5 deficiency, or a homozygous genotype of CCR5Δ32, was found to be protective against HIV infection [42–45]. In West Nile, CCR5 deficiency is not associated with incidence of infection, but is associated with severity of disease for infected individuals . Subsequent research showed that CCR5 specifically plays a role in the ability of cortical neurons to combat West Nile virus infection of the brain . In DENV, CCR5 deficiency has been linked with increased viral load and disease severity . The study also found that the CCR5 receptor in macrophages is necessary for replication of DENV serotype 2, an early step in the infection process . Given the similarities of these flaviviral diseases and the significant association of CCR5, the only gene looked at by research groups for both diseases, further research could be beneficial to further understanding the role of genetic variation in the development of severe flavivviral disease . When we meta-analyzed the DENV studies, we found significant associations between DENV disease and genetic variation in MBL2, PLCE1, IFN-γ, and MICB. The role of many of these genes in disease pathogenesis has been characterized through in vivo and in vitro studies. MBL2, the mannose-binding lectin 2 gene, encodes a protein with a role in innate immunity and complement pathway, while PLCE1 encodes an enzyme critical to the generation of the inositol 1,4,5-triphosphate (IP3) and diacylglycerol (DAG) messengers . MICB and IFN-y are both critical in the immune response, and thus variations within these genes could have strong effects on the initial response to the viral infection and the subsequent disease pathogenesis . Our study is limited by several factors, most notably by the available literature. To ensure we found as many papers as possible, we constructed a search strategy that involved multiple databases, used both subject headings and text words, was not limited to English articles, and included an ancestry search . Despite our focus on significant results and genes studied by at least two research groups, the wide heterogeneity among the populations studied limited our ability to interpret the meta-analyzed results. Lack of diversity in genetic studies is well-documented , and the absence of certain affected populations, particularly in Africa, among the identified studies further demonstrates this unmet research need . The diversity of results among studies that examined the same SNP could be due to population heterogeneity, as well as to differences in study approach, including selection of control and comparison groups. Additionally, previous exposure history, DENV serotype, and WNV or DENV genotype are all factors that can affect disease severity, but were not accounted for in the included studies . The number and type of genes examined varied greatly between studies, and we were limited by what genes researchers chose to sequence and include in publications. The unavailability of comparable genotype data and the incomparability of research groups across some studies preclude a more in depth analysis at present. The genes found to be significantly associated with WNV or DENV disease pathogenesis varied in function, with most being linked to the immune response. As the regions of the world affected by WNV, DENV, and related viruses such as Zika, continue to expand due in part to climate change, an improved understanding of the association between genetic variation and disease severity will be valuable for all potentially affected populations [55–58]. Based on the growing incidence of these diseases, the paucity of consistency in the associations found, and the limited overlap in genetic targets studied to date, there is need for continued and deeper studies examining the role of genetic factors in WNV and DENV disease severity. In addition to conducting new studies such as whole-exome sequencing within larger population samples, further analyses could be conducted of existing data, to glean novel findings such as gene-gene or gene-environment interactions, rare and low frequency variants, and pathways of significant determinants of anti-viral resistance. The authors are grateful to many colleagues for valuable advice, and particularly wish to thank Ms. Xiaomei Wang for technical input, Ms. Kate Nyhan, MLS, (Yale University Cushing/Whitney Medical Library) for guidance in the development of the search strategy, and Dr. Marina Antillón for translating Spanish-language articles during the full text review. MEC & RRM: AI 089992; SC: Self and Family Management T32 NR008346. The funders had no role in study design, data collection and analysis, decision to publish, or preparation of the manuscript. Conceptualization (MEC, ATD, RRM); project administration (MEC, RRM); data curation (MEC, SC); methodology (MEC, SC, ATD); formal analysis (MEC); writing – original draft preparation (MEC); writing – review and editing (MEC, SC, ATD, RRM). All authors read and approved the final manuscript. Not applicable. Data sets were extracted without personal identifiers and organized into literature tables. Covidence systematic review software. www.covidence.org. OASL - 2′-5′-oligoadenylate synthase-like protein. http://www.uniprot.org/uniprot/Q15646.